Pink Sexdeath, Degenerate Slug, Demon City Reaper? Three names have one thing in common – they’re all names thought out – and executed in musical form, by a man living in Kaliningrad, Russia. Not only does he have all those alter-egos, but many more that I won’t list. He is or have been a part of two groups called Modern Howl and Ninika, each one different from the other, but also closely knitted together by darker genres. Even though he’s had a lot of projects going on at the same time, he’s dabbling with a special kind of project which he calls “Zex Model“. This musical project started out not too long ago and pushed him further into musical obscurity than what you’d think. Considering this, his project has risen in popularity since his first releases – and opening for Lust Of Youth in Russia. With his official debut-album “Mind Slaughter” having been released on desire records in 2013, and a self-released EP titled “First Mutation” – he solidified his presence further. Once a darling in the brooding underground, now a good rated artist fit for another level in the underground. Simultaneously in another part of the world, a man by the name of Fade Kainer (Theologian, etc) self-releases his first album “Mask Visions Poison” under the name of Statiqbloom. This is in 2013. America have gained yet another notable industrial-act that strays away from the cliches, and embraces their own version of what inspired them in the first place. Meaning; they decide to twist the originals of the 1980’s and 1990’s by layering their own vision upon the ground which those men built upon. The building blocks are on a steady ground. The album itself sells out on cassette and remains on CD up until now. Two alternatives offered, one bought and sold. 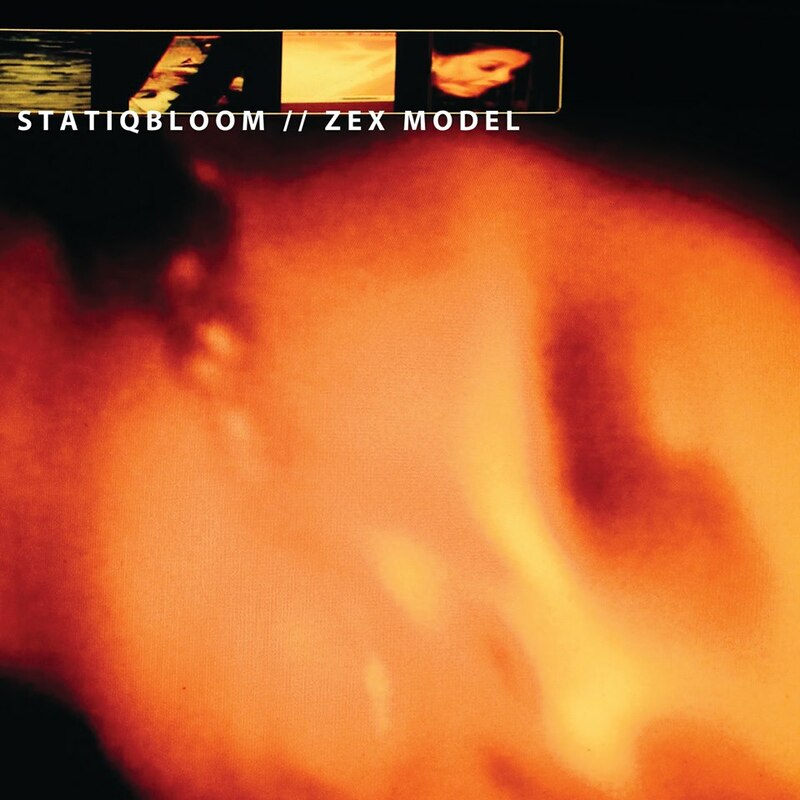 Even though both Zex Model and Statiqbloom are very much alike, the last-mentioned relies on heavy electro beats and a body rhythm, whilst Zex Model is utilizing the rough texture of industrial on experimental soil; to the maximum. Then we entered 2014 and brooding for Statiqbloom was yet another album which he gave the title “Black Mirrors“, released only on a limited edition cassette. This was to be a release before two kings met up and decided to build upon a platform settled by them both, and others. Diplomacy entered the game and here we are. Fast-forward to later October, early November this year and you’re in for a treat. It was only a matter of time until desire brought these two new-comers closer together. In regards to their sound, it was a sound choice. 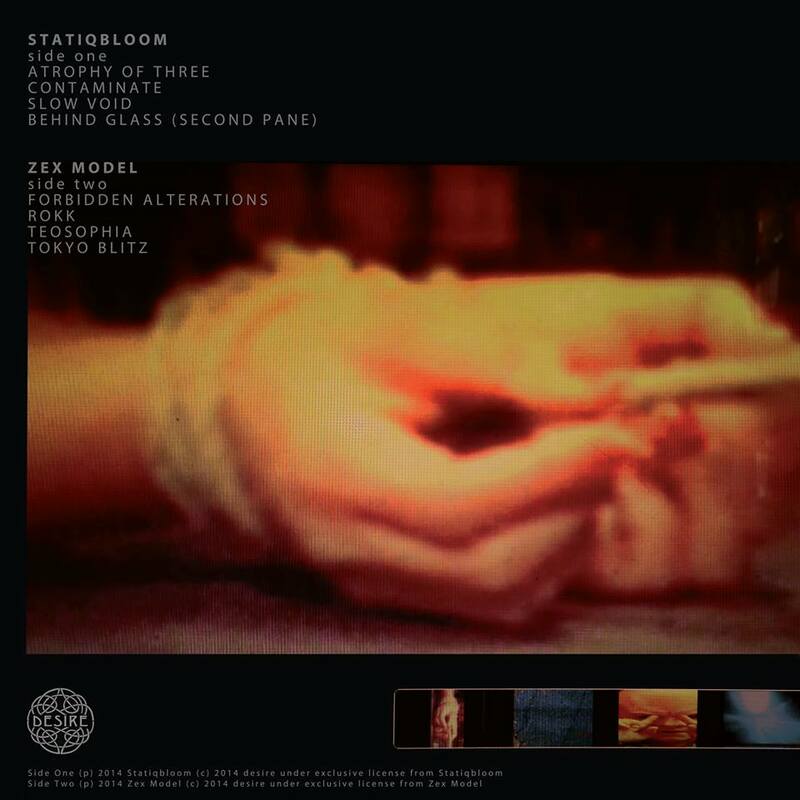 Zex Model and Statiqbloom engage in a split-release that features eight tracks in total and four tracks by each artist. The apt design for this release is what Fade Kainer thought out and did. From the first four “Atropy Of Three“, “Contaminate“, “Slow Void” and “Behind Glass (Second Pane)” courtesy of Statiqbloom on side one. To side two featuring “Forbidden Alterations“, “Rokk“, “Teosophia” and “Tokyo Blitz” by Zex Model. I chose the second track “Rokk“, because of the atonal message that is what makes his project what it is in the first place. From his ode to Skinny Puppy and the likes, to his experimentalism that fiddles with a classic industrial atmosphere and makes the atonality spin the wheel – a confusing sound which at first obfuscates the rhythm – but later on is quite a trip into the originality of his project. A harsher version of Nexus Kenosis might actually find a way through your mind, intentionally or not. Stream the exclusive track “Rokk” down below and see to that you buy the vinyl from desire records when it comes out, if you like what you’re hearing.